The world's lightest OLED binocular see-through smart glasses arrive almost five years after the introduction of the Moverio range, powered by a quad-core Intel Atom processor and sporting a HD Silicon OLED display. Although the Epson Moverio smart glasses might be unknown to most consumers, this family of smart wearables has been around since 2011. The company launched the BT-100 back then, followed by the BT-200 in 2014 while the Pro BT-2000 arrived one year later. Now, the time has come for Epson Moverio BT-300, a product advertised as "world's lightest OLED binocular see-through smart glasses." 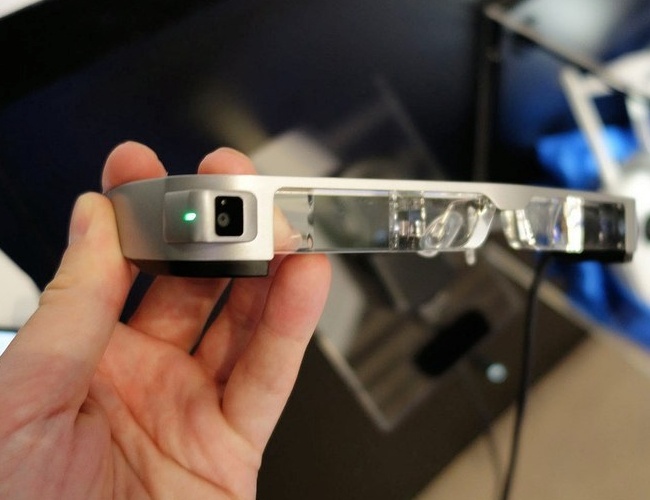 Epson's third-generation pair of smart glasses is powered by an Intel Atom X5 quad-core processor and runs Android 5.1 Lollipop. It has a 5 MP camera and a HD Silicon OLED display with 100,000:1 contrast ratio. Its connectivity features include WiFi 802.11 a/b/g/n/ac, Bluetooth, and GPS. The user interacts with the device via a trackpad and key while autonomy can go up to 6 hours while replaying moving images. According to Epson America's New Ventures' Product Manager Eric Mizufuka, the new Moverio smart glasses can be used for "drone photography, remote support, AR training/maintenance, healthcare, retail, logistics and more." While there is no information on pricing and availability yet, the Epson Moverio BT-300 can be seen in Barcelona during this year's Mobile World Congress, at Hall Congress Square Stand CS100.